Destitute Live in Coke Ovens, Uniontown PA, Feb. 23, 1935. Pennsylvania is Mopping Up! 1936. Harold F. Pitcairn flies his first autogiro to Washington D.C. May 1929. Raw footage of the Democratic Presidential Convention of 1936, including Smith and Roosevelt delegates fighting in the balcony, Al Smith speech, and Franklin Delano Roosevelt acceptance speech. Hunger marchers at the United States Capitol, Washington, D.C., January 6, 1932. Early in 1932, Father James Cox of Pittsburgh embarked on a pilgrimage. Although Cox was a Catholic priest, his goal was not eternal salvation, but relief from suffering in the here and now. On January 5, more than 6,000 fellow pilgrims followed Cox as he set off for Washington through his Depression ravaged home state. As the caravan wound its way through Huntington, Johnstown, and Harrisburg, thousands more joined along. By the time Cox arrived in the nation's capital on January 7, the number of his followers had swollen to the tens of thousands - the largest Washington protest march in the nation's history to that point. In a statement intended for President Herbert Hoover, Cox declared "We are not Red demonstrators. We are real honest American citizens and the people I represent here, as well as millions of others throughout the country, are entitled to work. In a country bursting with wealth there is no reason why employment and other relief should not be provided." Pennsylvania and the nation had suffered economic downturns before. During the 1800s, several "panics" had devastated the Commonwealth and the nation's economy. The panic of 1873 had persisted for nearly six years, and a national economic collapse in the 1890s left more than four million people unemployed. Although often devastating, particularly for workers and their families, economic recessions and depressions were considered by most Americans to be a normal part of a "boom and bust" business cycle inevitable in a free-market economy. What made the economic collapse of the 1930s different was its pervasive impact and duration. The Great Depression had deep roots. Lurking beneath the booming economic growth of the 1920s were structural problems that came to a head at the end of the decade. Historians still disagree about the causes of the Great Depression, but most concur that a grossly uneven distribution of wealth, an unhealthy dependence upon consumer debt, and speculation in stocks - and their subsequent overvaluation - were all pieces in a house of cards that came tumbling down on October 29, 1929. Men waiting in an unemployment line, Pittsburgh, PA, circa 1933. The Crash produced a vicious cycle. Hundreds of thousands of Americans lost their life savings in the collapse and saw their once profitable investments turn worthless. As consumer and investor confidence disintegrated, many Americans began hoarding money, a practice which contributed to numerous bank failures. Many more then lost their jobs in the largest wave of unemployment in American history. The years that followed produced the by now familiar scenes of America during the Great Depression: the long bread lines and overtaxed soup kitchens, the dispossessed huddled together in "Hoovervilles" and shanty towns, and the striking workers and political protestors. By 1933, a year after Cox's futile march on Washington, more than 37 percent of the Commonwealth's workforce was unemployed. This was a demoralizing state of affairs for a state that had prided itself on being the workshop of the world. Pennsylvania was home to U.S. Steel and Bethlehem Steel, the Pennsylvania Railroad, Westinghouse Electric, and numerous other manufacturers that produced everything from locomotives to textiles to canned goods. 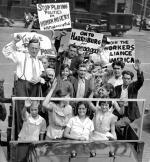 Indeed, at the outset of the Depression, only New York boasted more industries. With close to one million employed in manufacturing, Pennsylvania also boasted the nation's second largest industrial workforce. Between 1927 and 1933, industrial production fell by more than 50 percent and Pennsylvania lost 270,000 manufacturing jobs, the third greatest job loss in the country. In three years, the production of bituminous coal fell from 144million to 75million tons, and pig iron production dropped from 14million to 2million tons. The value of textiles fell 60 percent, wages in metal industry plummeted from $808m to $260m, and the total cash receipts of state farmers dropped from $324million to $175million. By 1932 Pennsylvania groaned under the burden of caring for the largest number of families seeking relief in the country - 324,000 of them, compared to 312,000 in New York and 234,000 in Illinois. Like most Pennsylvanians looking for a way out of the crisis, Father Cox initially embraced old fashioned remedies. The Pittsburgh diocese helped Cox and others establish "Houses of Hospitality" in ethnic, working-class neighborhoods to distribute food and clothing to the swelling masses of unemployed. From these and similar outposts sponsored by other local charities, Pennsylvanians did their best to keep malnutrition and homelessness at bay. When local charities and relief boards were overwhelmed by the needy municipalities turned to the counties, and the counties turned to the state. Focused on economic recovery and unwilling to raise taxes, the Republican majority in the State Assembly refused additional assistance, even when prodded by Gifford Pinchot, the progressive governor elected for a second term in 1930. Only after much delay did the state legislature agree to authorize a State Employment Relief Board. But the new outlay was tiny compared to the need. The inadequacy of local and state responses assured the election of Democratic candidate Franklin Delano Roosevelt as President in 1932. (Pennsylvania, where voters had demonstrated solid loyalty to the Republican Party since the 1860s, was one of only six states to stay with Herbert Hoover.) During the historic first 100 days of his administration, FDR and his advisors drafted critical pieces of legislation that would become his signature program: the New Deal. Over the next eight years, Roosevelt and his fellow New Dealers would erect a network of "alphabet agencies," including work relief programs that employed millions of Americans. For the first time in American history the federal government became a regular presence in the lives of ordinary Americans, initiating everything from direct relief to massive public works programs; from public housing to federally funded arts and theater productions. Convinced that New Deal programs were hampering recovery and fearful of the enormous patronage that federal programs would bring to state Democratic Party, Pennsylvania's Republican leaders did their best to block the introduction of federal relief dollars into the Commonwealth. The deepening Depression, however, soon drove voters away from the party of Lincoln. In 1934, Pennsylvania voters elected the first Democratic governor in more than forty years. In the years that followed, Governor George Earle and a new Democratic majority in Harrisburg introduced their own "Little New Deal," a package of state-level government programs and legislation intended to reinforce and mirror the national program. Between 1937 and 1939, the legislature passed more social legislation than any other sitting legislature before or since. Other struggles also gripped the Commonwealth. Massive layoffs in the steel, textile coal, and other industries mobilized and re-energized Pennsylvania's industrial workers in their decades-long struggle for better wages, safer working conditions, and union representation. Prolonged periods of unemployment, combined with the evaporation of corporate welfare programs, also weakened workers' fidelity to their employers. Backed by new federal legislation and court decisions, Pennsylvania workers across the Commonwealth staged a succession of strikes and forced major employers to accept union representation. 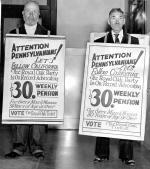 Royal Oak Party supporters, Philadelphia, PA, October 24, 1938. From 1935 through 1938, George Earle and the Democratic majority in the state legislature distributed millions of dollars and millions of jobs through the administration of federal relief programs and its own Little Deal. As in many other states, however, these programs quickly became entangled in politics. Capitalizing on an economic downturn, corruption scandals in Harrisburg, and FDR's attempt to pack the Supreme Court, state Republicans won a landslide victory in the election of 1938, regaining control of the governor's office, the state House and Senate, and the state's Congressional delegation and both Senate seats. Despite his election promises, however, Governor Harold James and the new Republican majority made few changes, and continued to rely upon federal dollars and New Deal programs until after American entry into the Second World War. Today, historians continue to debate the New Deal's effectiveness. Many note that the start up of defense industries after the start of World War II in Europe - not government relief programs - ultimately licked unemployment. By then, however, Pennsylvania had undergone deep changes. A state that had opened the decade as a bastion of "industrial feudalism" and GOP stronghold emerged at the other end as a two-party state and a center of the industrial labor movement. Its relationship to the national government, too, would continue to grow, as federal funding helped Pennsylvania emerge as "The Arsenal of Democracy" during the Second World War.